A developer said he was testing a vulnerability. But when Google got the service back up and running, he crashed it again. New Android apps and updates were blocked from appearing in Google's Play Store on Monday, after a hacker attacked Google's app publishing system. It's an outage you may not notice -- until it holds up the next update to Candy Crush, Plants v. Zombies or Clash of Clans. But developers are furious. The publishing system known as Google's Developer Console first crashed mid-day Sunday. 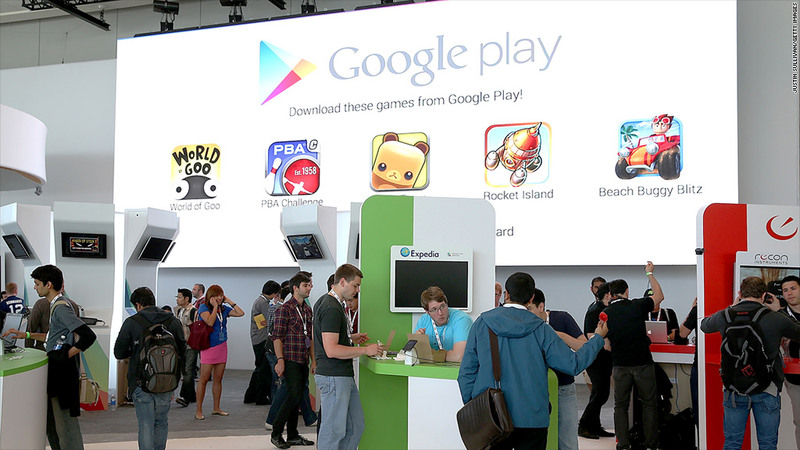 Many app developers still found themselves blocked from uploading to the Google Play Store on Monday. Some developers noted the issue appeared to be resolved on Monday, but another posted in a Google forum, "problem started again." Meanwhile, Android users don't have access to new apps and updates. Existing apps are still available for download. Google's (GOOG) Android software powers nearly 80% of the smartphone market. Ibrahim Balic, a Turkish hacker, claimed responsibility for the attack. He said developer console crashed when he tried to test a vulnerability he discovered. Balic wrote an app to exploit the flaw, which he expected to fail. But he said he didn't expect it to knock everyone offline as well. Balic pleaded forgiveness from his online peers. He said the site crashed again when he uploaded the app to Google's publishing system a second time. "I just wanted to be sure about (the) vulnerability," he said. Balic said he notified Google of the issue but has yet to hear back. On Tuesday, Google said the issue impacted "a subset of developers." The company underscored that the issue did not prevent Android users from downloading existing apps. Google's press office did not immediately return a request for comment from CNN. By his own account, this isn't Balic's first joust with smartphone app developers. He claimed to be the intruder behind an attempted hack of Apple's (AAPL) Developer Center last summer. Android developers blocked from uploads this week voiced their frustration on Google's site and elsewhere online. They wrote in outage reports from Ireland and Israel to Spain and Russia. "You really uploaded that thing again?" one posted on Reddit. "Now it will be quite hard to explain that it was accidental..."
"It's quite something what you did, but I would also get a lawyer to be safe."